Kahwi Leonard playing north of the US border. 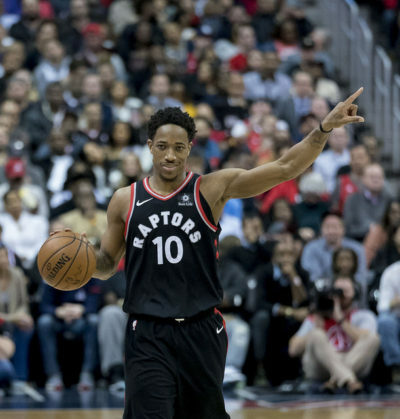 The Raptors took the plunge, dealt DeMar DeRozan and now will see if Leonard can take them to the championship. Leonard played nine games last season, so while he’s an amazing player, we have no idea what Kahwi can really give the Raptors. In time we’ll see how spry and effective he is in Toronto. Nick Nurse can integrate him into the Raptor offense and bolster the Raptor defense with a former defensive player of the year. LeBron’s first season with the Lakers. New team, new conference, lots of changes have happened for LeBron. How it all plays out will be cool to see. Can the veterans Rob Pelinka brought in to help LeBron play together? Most of the guys the Lakers added haven’t played with each other yet and wherever LeBron plays, huge expectations follow. Luke Walton addressed those expectations around the 10:40 mark of an interview from Summer League. Coach Walton is smart and he’ll get everyone to mesh and focus on the court, but it won’t captivate LA from the get go. Ugly possessions will happen and players won’t know exactly where their teammates want the ball, but in time the level of play will grow like a wild flower along the highway. Teams that can surprise legit contenders, like the Hornets and Nuggets. The Hornets added Tony Parker and even though he’s towards the end of his career, he’ll add meaningful depth at the point guard spot. Parker can give Kemba Walker a breather and distribute the ball better than Walker. Getting more of the Hornets to score would be huge for them, it would take pressure off Kemba and make the Hornets tougher to defend. The Nuggets were one win away from making the playoffs last NBA season. After losing a battle with the Timberwolves on the last night of the regular season, Denver kept their core and added Michael Porter Jr. and Isaiah Thomas. It would be shocking if they’re healthy and don’t make the playoffs this season. Denver is talented, young, and hungry for post season experience. Come April their should be a feast in the Mile High City! One of, if not the last NBA season Dirk laces up. Dirk Nowitzki is a future Hall of Famer and an elite outside shooter. He’s going into his 21st season with the Mavericks and likely his last. Dallas is rebuilding and Dirk has joyfully hung on throughout the process, which will continue to progress this season. Dennis Smith Jr. is going into his sophomore campaign, DeAndre Jordan is going to rebound and do DeAndre Jordan things, plus Luka Doncic brings tons of international experience as a rookie. The Mavericks are really well coached and will at least compete in the twilight of Dirk’s career. Here’s to Dirk staying healthy this season and having as much of a blast in his 21st season as he did throughout the prime of his career. Kyrie Irving and Gordon Hayward coming back for the Celtics. The Celtics have tons of talent and only 48 minutes to get everyone on the court. Kyrie fits well with everyone, he showed that in 60 games last season. The mystery is Gordon Hayward, who missed the season after going down in the first game. Hayward is a terrific scorer, but it’s unclear how he fits with the team. Another unknown is how Coach Stevens dolls out minutes, with so many rotation worthy players at his disposal. Not a bad problem for Coach, but Hayward tends to slash less than Jaylen Brown, and Hayward scores more from three than in the mid-range, ala Jayson Tatum. Getting Hayward to change his game from how he played in Utah will happen, but Hayward hasn’t played enough with the Celtics to adapt yet. Next NBA season will be full of juicy storylines! Did your team not covered in these five things to watch? Is there a player who’s primed for a breakout year? Chime in with a comment about what you’re most looking forward to this season! Frank Ntilikina: Star in the Making?